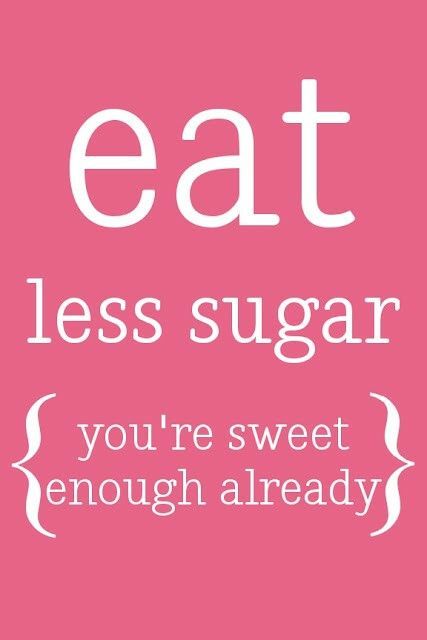 Eat Less Sugar, You’re Sweet Enough Already! The white caster sugar as we know it is so highly processed that it’s origine (a sugar beet or sugar cane) is not recognizable anymore at all! It’s has been exposed to several chemical processes until what you have left is a white grain of sugar and the nutritients that where originally in the sugar beets and sugar canes are lost. Sugar does not only have no nutritional value, it also makes are bloodsugar go sky high when whe eat/drink the sugar (for example in our cup of coffee or tea) or eat products that are made with sugar (for example candy and cookies). This affects our hormonal balans. The sugar gives you a short ‘boost’ of energy, but after that boost the energylevels decreases. Because refined sugar doesn’t provide us with any nutrients you won’t feel saturated after eating sugary products and you’ll be more likely to eat more. It’s almost like an addiction; the sugary taste of products tickles our brains and makes us want more and more sugar. Be careful and always take a look at the ingredientlist if you but packaged food! Sugar is used in so many products, even in the ones that you might not expect it: meats, soups, sauces, bread, packaged juices and in lots of ready-to-eat meals! Easy tips for eating less sugar! Buy foods that are as close to their ‘natural’ state as possible (fruit, veggies, legumes!) and avoid ‘packaged’ foods! This doesn’t only apply to your main meals, but also to your snacks! So switch that so-called ‘healthy biscuit’ or ‘healthy bar’ (they probably contain a lot of sugar or other sweeteners!) for some fresh fruit/veggies and a handful of nuts! Train yourself and get used to a less sweeter taste! Learn to appreciate other flavours. Did you know that you will eventually taste more ‘sugar’ when you stop eating refined sugar? → By avoiding the refined sugars you will give your tastebuds the change to learn to recognize the natural ‘sweet’ taste of natural products again! What do you think about the use (or not-using) refined sugars and what are your experiences? Share your thoughts! Posted in Background information, My lifestyleTagged healthy, less sugar, natural, sugarfree, sweetBookmark the permalink.